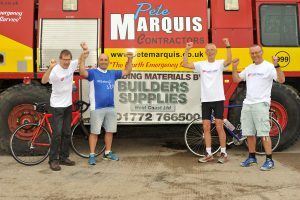 Alan Taylor’s Three peaks + Cycle Challenge. Groundwork professional and road race organiser extraordinaire Alan Taylor of Fulwood, Preston and long-time member of Wesham Road Runners is about to embark on a Three Peaks +Cycle challenge supported by Pete Marquis Contractors and Builders Supplies West Coast to raise funds for Rosemere Cancer, Mummy’s Star and Bowel Cancer and celebrate his 50 years, and in memory of Ben Ashworth and Graham Vickers. Ben did the Challenge himself in 2015 with Alan but subsequently lost his battle against cancer. Graham Vickers, long term member and past chairman of Wesham Road Runners, sadly passed away last weekend just prior to his 61st birthday. Starting with an ascent of Ben Nevis from Fort William next week in the company of John Rudd, Chris Moss, John Collier and Alex Rowe Alan and his team will then cycle for three days to Ambleside and ascend Scafell from Wasdale Head. A further days cycling will see a rest night at home in Preston before continuing another two days cycling to Llanberis for the final day up to the summit of Snowdon. The distance cycled will be 440 miles, with some 14,000ft of climbing up and over the moors, with a further 11,180 climb on the three mountains. Donations can be given at uk.virginmoneygiving.com at ThreePeaksCycle2.